Bariatric Commode Considerations Before You Buy. no matter the size, nature calls all! A bariatric commode is a heavy duty toilet bedside commode designed for heavy people over 250 pounds (bariatric commodes). Usually a core steel frame and plastic arm rests. A removable and washable bucket, toilet lid and a padded seat and back rest. These commodes can accommodate upwards of 650 lbs with some weight limits up to 900 lbs. Two critical considerations before considering a bariatric toilet bedside commode is the weight limit of your commode and the widest part of the patient. Weigh the patient so you select the correct commode. Next, measure your patient at their widest while sitting. This width is what you will need to compare to the inside width between the side arms. 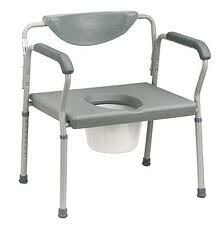 Also consider the adjustable height of the commode for patients who are not able to get up and down easily. Drop arms can come in handy in a bariatric situation for a couple reasons. Dropping the arms can accommodate lateral transfers of the patient to and from the commode. They can also be dropped to allow more sitting room if needed. Although these commodes fall into the 3-in-1 bedside commode category, they by nature turn into a 2-in-1 commode eliminating the bathtub option as bathtubs are generally not wide enough to accommodate them. However, it is possible to use a bariatric bedside commode as a transfer tub bench (without the bucket) as long as the side arms can drop. Consider this money saving option when checking your list twice! One more point of consideration: these commodes can be heavy to move around. If your patient is going to be needing to move the commode here and there, be sure you have sought out the lightest weight you can find. Don't, however, fudge on safety and weight limit capacity. And lastly, it's never too late to begin strength training exercises to improve mobility and independence. It takes a while to become debilitated. It can take some time to gain strength but a little effort every day will go a long ways! Tell us how you save money with physical therapy equipment.